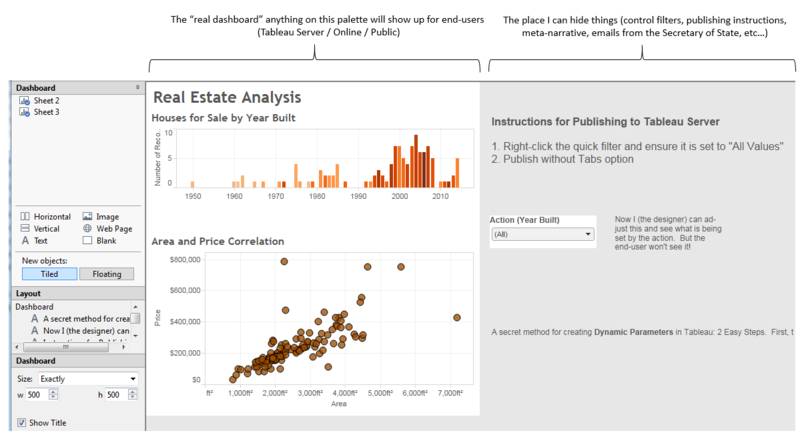 Wouldn’t it be great if there was a way to hide something on a Tableau Dashboard? Something you, the designer wanted to see, but not something the end-user of the published dashboard should see. Maybe it’s a set of instructions to remind yourself of how quick filters and parameters should be set prior to publishing. Maybe it’s a drop down control for your action filter(s) so you can see what actions have been triggered and easily reset the action. Maybe it’s an email message from the private account of a government official that you want to keep from the prying eyes of the public. Whatever the case, there is a way! You can place any dashboard item just off the dashboard (in a fixed size dashboard) and when it’s published, the end-user will never see it. The only trick is how to get something off the dashboard. If you drag it there you get nothing. Or if it was already on the dashboard, dragging it off is the same thing as removing it. So instead, place it on the “real dashboard” as a floating item. Then use the Position controls in the lower left to set the X and Y coordinates to position it off the dashboard. The end result is a published dashboard that hides all the elements that were off the dashboard. I sure wish I’d known this technique when I developed the Choose Your Own Adventure or BlackJack! dashboards. Then, I created a secondary dashboard with everything on it and a special action filter to “reset” the dashboard as I designed and tested. Instead, I could have just hidden the action filters off-grid and reset as desired. You’re welcome Raj! Thanks for the encouragement. This should be immensely useful for all of us that develop dashboard which will updated by others later on. Should be great for dashboards I’ll always own that require tinkering with filters and other properties every time the data gets updated. Steve, That’s exactly how I’ve started using it. Thanks for the feedback! Great tip, thanks for sharing, Joshua. Used this trick today – excellent piece of work! Thanks Andy! I’m glad you found it useful. Great tip Joshua! I usually put mine right at the edge and then delete before publishing. Never thought to move them completely off and leave them. Old dog, new trick. Thanks Shawn! I remember hearing someone say you could move things off the dashboard – it took me a bit to figure out how, but once I did I couldn’t stop thinking of all the possibilities! I like the idea. As a side note, the comments are visable to people opening the workbook with the free tableau reader. Thank you for all your work Josh. Your secrets are really valuable in improving my Tableau skills. I am trying to implement the idea in this article into a dashboard of my own button I cannot get Action(ID) to appear in the list of available quick filters. Is there an option somewhere I need to select. The knowledgebase gave no further answers. I await the release Tableau Star Trek 2 with excitement ;). You should be able to add an action from a view where it is being used as a filter. Check the target sheets and see if you can get it from their drop down options. This is amazing and so cool. I’ve often wished I could do ‘comments’ on a dashboard similar to Word to remind myself of things. This is a much better solution than what I end up doing …which is printing and making notes on the page and then hoping I can find it again. This appears not to work for Dashboards that have a larger size. For example, I have a dashboard that is 1700 by 1100 (Tabloid). I cannot scroll over far enough to see the items that are “off” the dashboard. Any thoughts? Joshua, I need something simpilar. We have a standard template for customers but they don’t all the the same info. For example, NYC, needs their data by Borough, but Orlando does not. What we want to do is if the sheet on the dashboard is blank or null we want it hidden from the dashboard. Do you know if this can be done and if so how it is done? Possibly. By sheet, are you talking about a visualization? Or something else? I would definitely recommend looking into user or group filtering and see if that applies to your case. Otherwise, feel free to reach out with details and I’d be happy to take a look! This is a great hack. Is there a way I can publish the dashboard with All being hidden. I have a massive dataset and I’d like to limit the view. Thank you for this! A really nice application of this is for embedding in web applications where you might want to still pass the filter data out to the external UI instead of leaving it to clutter up the dashboard itself. It was a huge time saver for us and really improved our load times. You’re welcome! I’m glad to hear you found it to be of practical use! Hooray! I have a large customer that does not have Tableau but likes the dashboards. We’ve been cleaning up the 264 pages for a PDF presentation. Did not want to see filters, at all, or navigation on the final printed reports. Now to automate the PDF file creation…. Thanks for the comment! Glad that helps! Hey, Recently i embedded Tableau report into react application. i dont want show all tools in toolbar. just want to show only download option.can any one help me in this issue. This is an AWESOME tip, thank you! Do you think you could update this to show that the position controls are now in the top left of the Layout pane? Thank you! It’s a bit hard to keep everything up-to-date with UI changes, but I’ll definitely look into updating these images. I have used the button techniques and it works, but I am having trouble hiding the drop-down controls when, in Tableau Reader, I click on the different buttons. If you can help me understand how to hide them, I’d greatly appreciate it.. I am not quite understanding how to hide the drop-down controls? And why didn’t I think of that before? Brilliant! !